Whichever way you spin it, the purpose of the exercise is, by hook or by crook, to get your name in the hat for the next round of the cup. 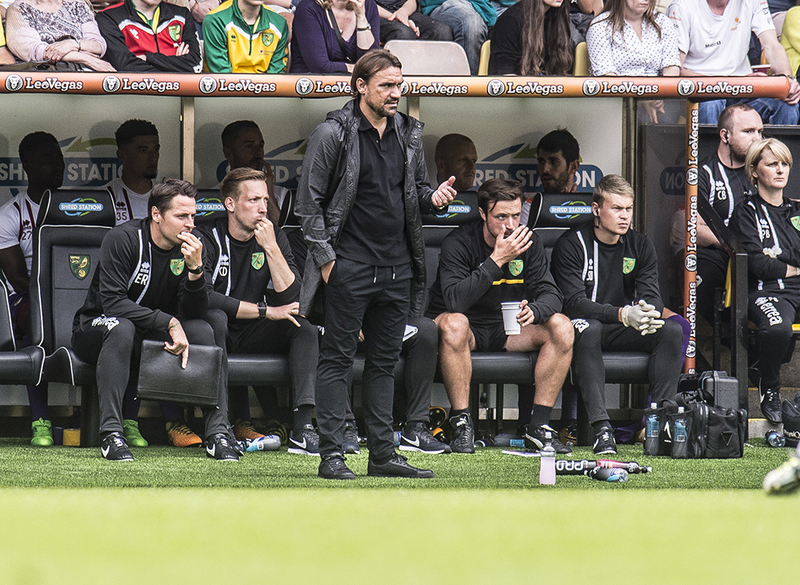 By that barometer, City did all that was asked of them last night and that there were a few “ups and downs” along the way – as Daniel Farke described them – was hardly surprising given there were 10 changes from the side that lost to West Brom at the weekend. But it was job done, even if it did take two very late strikes and the introduction of some big guns to seal the deal. Max Aarons and Todd Cantwell – given joint responsibility for the functioning of City’s left flank – will have learnt more in 90 and 78 minutes respectively than they will in a dozen under-23 games, and so it was only right they earned a nod from the gaffer who, after a first-half of copious instructions, acknowledged tangible improvements from the pair as the game went on. It’s impossible, of course, to ignore the stop-start nature of the performance and how for long periods there were echoes of West Brom, with a seemingly composed, controlled performance being turned on its head by the concession of an equaliser. But Stevenage, for all their spirit and endeavour, are not crammed full of ex-Premier League players and on this occasion City, helped by the addition of some quality from the bench, were able to go through the gears in the nick of time. While Christoph Zimmermann’s goal was the flukiest of flukes, City had been asking questions, and Dennis Sbreny will have gone to sleep last night wondering quite how he didn’t manage to open his account for the season as City pushed hard in the final 20. An impressive cameo at St Andrew’s from Sbreny whetted the appetite for, potentially, his coming of age in the Championship, and it’s important he offers some genuine competition to Jordan Rhodes, so it’s therefore disappointing that he was unable to properly kick-start his season last night. Equally it’s clear that a lot of huffing and puffing that amounted to very little was transformed by the late arrivals of Teemu Pukki and Onel Hernandez; also that the half-time arrival of Kenny McLean – on for an injured Tommy Trybull – had an impact on City’s forward thrust. With Stevenage legs tiring, the introduction of Hernandez was an ideal option. With his endless energy and searing pace, it was almost inevitable he would have a positive impact on the game. It’s hard to overstate how valuable a fit and firing Onel could be to City’s season. Pukki – one of the least heralded of the summer signings – has gone about his business in an understated and unselfish way but has had the biggest impact of the new arrivals. With his clever movement and ability to find space just in behind the main striker, he has quickly become integral to Farke plans. Much is spoken of the need for new faces to ‘hit the ground running. Pukki has done just that. Celtic fans were quick to pour scorn on our new Finnish signing when he arrived, which perhaps partly explains why expectations were modest, but here is a player who’s already attuned to the hustle and bustle of the Championship. Robin (Sainty) likened his style to that of one Kevin Reeves (ask your mum or dad), and compliments don’t come much bigger. So, we’ll take a 3-1 and move on – even if it was a bit scrappy. Others of a similar ilk saw their Carabao Cup dreams ended at the first hurdle. Excellent assessment. I don’t, unfortunately, need to ask older folks about Kevin Reeves at my advanced age! I hadn’t thought of Robin’s comparison myself but I’ll have a good look next time. Hope TT is okay as those in the know reckon he’s a shoe-in against the lovely Chris Wilder’s Blades. another good summary from last nights game. I had promised myself not to go on to the Pinkun live feed because it is so depressing and negative and I really don’t think MB or DF help in there selection of comments they post. I agree last nights main aim was to get to the next round to generate some cash flow and to give some fringe players game time and for 70 mins it was touch and go who would win. I don’t think Farke expected Stevenage to be up such a tough opponents but like city they wanted the next round and a home draw. Zimmermann went from fall guy to saviour even if he knew nothing about his final touch and Pukki is proving do far the jock critics wrong and may long it last. Farke was on a no winner last night if he put out a strong first team whingers would have said why when we have Sheff U on Saturday, then there are the ones that moaned about his team saying he doesn’t know what he is doing picking an inexperienced side with so many youngsters they need to be blooded at some time and last night was as good a time as any. Sbeny will hopefully turn the corner soon and show his goal scoring ability that made Webber/Farke push to get him. Remi made a losing start for his new club v Leeds. – Pukki might well be an excellent signing based on the two matches I have seen. Totally agree. The way MB in particular phrases his displeasure with the way we are playing is set up to entice as much extreme comment as possible. I also have a private sweepstake on how long it will be before he tells us how awful the ref is – something always sure to fire up gullible fans. 10 minutes is normally about right. As for the game, is the fortunate Zimmermann our equivalent to Harry Kane? While I rarely follow games via the Pink Un live feed, preferring Twitter comments if not actually at the game, personally, I don’t have an issue with the frankness of either MB or DF. Seems like they’re on a hiding to nothing if they sugar coat comments about a poor performance. Obviously a performance is subjective, but the reviewer should be as honest as possible in his opinion. If the journalists position is compromised – and that has been the case on and off over the years between club and Archant and/or CR – then they should refuse to do it. Integrity counts, but not if you have a CEO or similar leaning over your shoulder. I actually think MB has been reasonably conservative and could easily be more critical if he really wanted to. He is one of the ‘realists’ in my view and it will be interesting how his reports are if things don’t pick up in the League. I am very fortunate in that I never miss at home and really quite enjoy Chris Goreham’s commentary when we are away, especially if he has Mark Rivers or all-too-rarely Mark Walton (the very best) alongside him. I always switch off before Canary Call begins because I value what little remains of my sanity. MB and DF have quite a hard job to do actually. They have to watch the game, comment on it and field comments all at the same time. No clue about DF but I know MB is a true Yellows supporter. An additional problem MB and DF have is that they get Ipswich trolls on the live feed plus one particular non-Ipswich troll who loves to assume the identity of regular posters on there in order to stir it up. Back I the day I had a telephone and a typewriter – and that was hard enough! My comment in some ways has gone a little of what I was trying to say. I agree DF and MB do a good job on the commentary of the game but they select the comments to put on line that have been submitted and it seems the more controversial the more chance you have of getting it shown. There was a comment last season from someone who disagreed with with what someone else had said it wss published so he came back in with a stinging retort asking why his earlier comment was published and the reply was a simple I didn’t like it surely if a commrnt isn’t rude or deflamitory then it should be published. I don’t engage with Archant on any level apart from having he odd beer with my graphic designer mate Dread. However I believe MB is a decent journalist. It’s slightly easier for independents such as MFW because we don’t have NCFC itself coming down on us like the proverbial ton of bricks every time something appears that they don’t like. I guess Archant are under far more restrictions than we are in that given situation. However all us MFW writers (even me) keep it “clean”. No point in gratuitous insultive nonsense, after all. As Editor Gary said the other day we don’t really need too much negativity just now.. So far so okay. Well I will gave to go to the BBC in game reports as there is to much whinging. Thank for the reply and looking forward to the next articles. We still have 2 weeks of the lian window open I hope we can get a couple in to bolster the squad and possibly sell Oliveria and loan out Martins. Not much to add to that report, Gary. Except a small moment at the end of the game which seemed to me significant. Jordan Rhodes has been under a cloud since Saturday, getting justified stick for his penalty failure. He could have sulked, but last night we saw the opposite: he supported the team throughout, and at the end came on to put an arm around Srbeny and give him some words of encouragement. I think if Rhodes is enjoying himself he’s an asset to any Championship side. Hopefully we can get the ball in the box more regularly to feed him. Good point Don… he’s one that thrives on good service. He won’t be whacking too many in from 25 yards. Great sum up again as I am used to on these pages. I rarely read and comment anywhere else, got fed up with being abused and trolled on various others. I thought that stood out to me as a good point. The list of mistakes and the players is growing. Last night there were 10 changes and still similar mistakes. What do you and the readers think?